My love of films comes from both my parents. 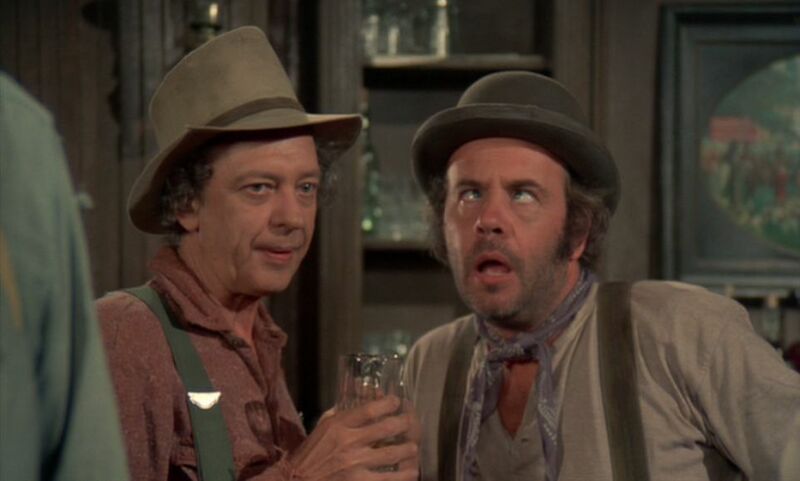 Dad loved to talk of the westerns while Mom seemed to know most of the actors and character players that endlessly turned up in both movies and television shows from my youth. A while back I began nagging my Mom about her recollections of going to the theater as a young girl. In the back of mind I had thought this would make a nice nod to her on Mother’s Day. As her memories surfaced it turned into more of an interview as I kept poking her for more. Here are some of the memories she shared as they came flooding back to her. Ten cents to get into the theater on a Saturday or thirteen through the week. With a quarter in your hand you had enough left over to get a popcorn at the concession stand. When the curtain went up she would see films like a Bowery Boys feature, Roy Rogers and Hopalong Cassidy. Perhaps a Woody Woodpecker cartoon along with a Three Stooges short. Martin and Lewis, Tarzan or maybe Abbott and Costello’s latest. 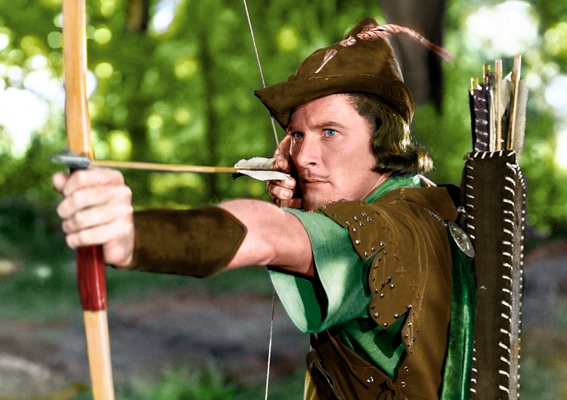 Errol Flynn as Robin Hood in what would have to have been a rerelease. The double bills. Francis The Talking Mule and seeing Steven McQueen in The Blob. June Allyson was a favorite and she recalls seeing The McConnell Story, Strategic Air Command and The Glenn Miller Story. Kind of weird that all three films involved June and planes. Alan Ladd’s classic Shane. Don’t Go Near The Water and The Naked Jungle with one of my favorites Charlton Heston. Funny how if I look back I recall at a young age seeing Heston in Earthquake at the theater thanks to my parents taking me. 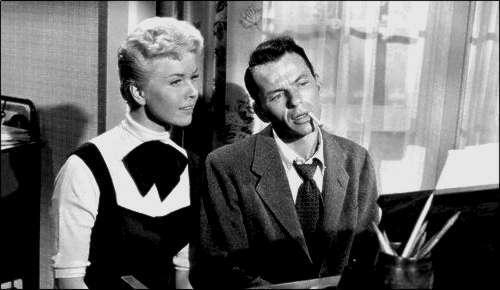 Frank and Doris eliciting tears in Young at Heart. She enjoyed A Man Called Peter and went to see Sink The Bismarck. Gimmicks at the theater like Dish night where you could win a set and be serving breakfast off them the following morning. By the time 1960 rolled around she tells me she had a date with Dad and off they went to see North to Alaska with the Duke. Getting into a long line of cars to see another Heston film at the drive-in on opening night 1968. Planet of the Apes. That had to be cool. The conversation morphed into her recollections of television and not having one in the home till she was about twelve years of age. Ed Sullivan and the one hour westerns with Lash LaRue, Bob Steele and the Cisco Kid. Since the television sets were black and white there was apparently some sort of plastic film or sheet you could put over the front of your set that would somehow turn what you were seeing into color. Sounds like a dollar store gimmick to me that probably didn’t work too well. She didn’t talk much of the seventies but by then my sister and I were around the house. So with me in tow off we went together to see things like Airport ’75 and the next sequel Airport “77. The thriller Grizzly at a drive in. Some of the Disney releases with Don Knotts and Kurt Russell among others.